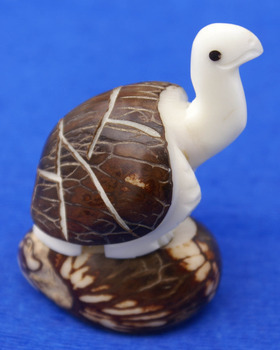 Turtle souvenir carved tagua animal figurine. Handmade in Ecuador. Payment: bank transfer, western union, moneygram, paypal. Other payment option possible upon agreement. Shipping: by certified post, EMS, FEDEX. Other shipping agent possible by agreement. For most of the products we dont have any minimal limits for purchase, but if you buy more, you get visible discount in prices. Also transportation of bigger number of units usually is cheaper. We provide discount on gross order you make with us, so you may order a small amounts of different products and you still get the best prices. Presented price ranges might be not final, actual current price may depends on different factors, such as on current market conditions and currency exchange rates. Please request current version of our catalogs of products in PDF.